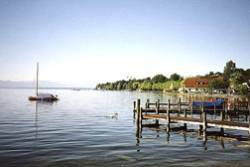 The 2012 International Conference on Localization and GNSS will take place from June 25 to 27 in Starnberg, near Munich, Germany. navigators, PDAs and mobile devices. Abstracts may be submitted online beginning in February. The deadline for submission is Friday, March 2, 2012. The event is organized by DLR, the German Aerospace Center and by a technical committee of American and European GNSS professionals. For more information, contact Stephen Sand, general chair, at the email address below.